Lake Louise is an immense winter playground offering one of the world’s premier alpine resorts, unlimited cross-country skiing, ice-skating, sleigh rides, and nearby heli-skiing. Between November and May, accommodation prices are reduced by up to 70 percent (except Christmas holidays). Lift and lodging packages begin at $100 per person, and you’ll always be able to get a table at your favorite restaurant. Canada’s answer to U.S. megaresorts such as Vail and Killington is Lake Louise (403/522-3555 or 877/253-6888, www.skilouise.com), which opens in November and operates until mid-May. The nation’s second-largest winter resort (behind only Whistler/Blackcomb) comprises 1,700 hectares (4,200 acres) of gentle trails, mogul fields, long cruising runs, steep chutes, and vast bowls filled with famous Rocky Mountain powder. The resort is made up of four distinct faces. The front side has a vertical drop of 1,000 meters (3,280 feet) and is served by eight lifts, including four high-speed quads, and western Canada’s only six-passenger chairlift. Resort statistics are impressive: a 990-meter (3,250-foot) vertical rise, 1,700 hectares (4,200 acres) of patrolled terrain, and more than 100 named runs. The four back bowls are each as big as many midsize resorts and are all well above the tree line. Larch and Ptarmigan faces have a variety of terrain, allowing you to follow the sun as it moves across the sky or escape into trees for protection on windy days. Each of the three day lodges has a restaurant and bar. Ski and snowboard rentals, clothing, and souvenirs are available in the Lodge of the Ten Peaks, a magnificent post-and-beam day lodge that overlooks the front face. Lift tickets per day are adult $89, senior $74, youth $62, and child younger than 12 $28. Free guided tours of the mountain are available three times daily–inquire at customer service. Free shuttle buses run regularly from Lake Louise accommodations to the hill. From Banff you pay $25 round-trip for transportation to Lake Louise. 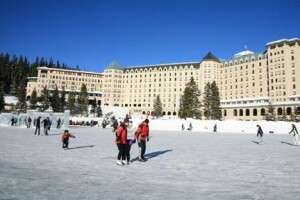 For information on packages and multiday tickets that cover all three park resorts, go to www.skibig3.com. The most popular cross-country skiing areas are on Lake Louise, along Moraine Lake Road, and in Skoki Valley at the back of the Lake Louise ski area. For details and helpful trail classifications, pick up a copy of Cross-Country Skiing to Nordic Trails in Banff National Park, from the Lake Louise Visitor Centre. Before heading out, check the weather forecast at the visitors center or call 403/762-2088. For avalanche reports, call 403/762-1460. Of all the ice-skating rinks in Canada, the one on frozen Lake Louise, in front of the ch<\#137>teau, is surely the most spectacular. Spotlights allow skating after dark, and on special occasions hot chocolate is served. Skates are available in the chateau at Chateau Mountain Sports (403/522-3628); $10 for two hours. Brewster Lake Louise Sleigh Rides (403/522-3511) offers rides in traditional horse-drawn sleighs along the shores of Lake Louise beginning from in front of the chateau. Although blankets are supplied, you should still bundle up. The one-hour ride is $34 per person, $22 for children. Reservations are necessary. The rides are scheduled hourly from 11 a.m. on weekends, from 3 p.m. weekdays, with the last ride between 6 and 9 p.m.